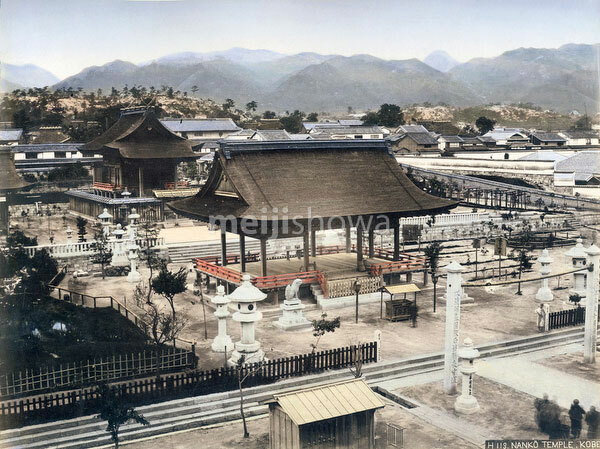 Panoramic view of Minatogawa Jinja, a Shinto shrine in Kobe, Hyogo Prefecture. The shrine venerates the spirit of military commander Masashige Kusunoki (1294-1336), and is located around the location where the Battle of Minatogawa (1336) took place. During the Edo period, Kusunoki was made into a patriotic hero and called Nanko or Dai-Nanko, hence Minatogawa Shrine is also called Nanko Shrine.